Mucktar Akomalik knows a thing or two about the melting of Arctic ice. The Inuit elder remembers well how much thicker the ice was when he still hunted for seals. These days, it’s only about one meter thick in June at the height of the hunting season, says the 73-year old hunter and fisher from Arctic Bay, in Canada’s North. It’s also less passable, because there are often pools of water on it. 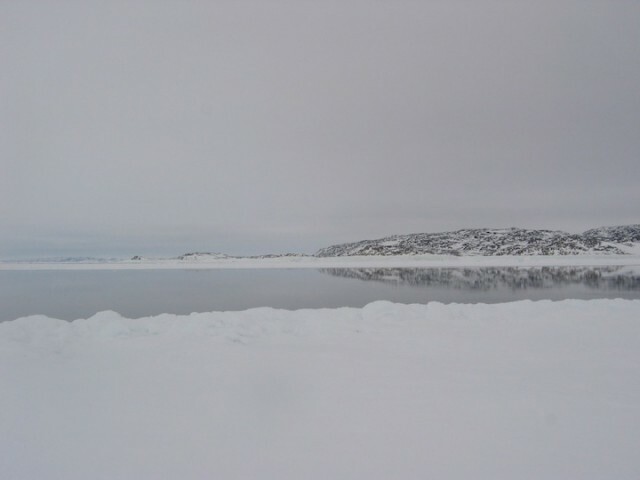 Sea ice and open water in Nunavut. In the Arctic, the effects of global warming are strongest. Akomalik hopes that the international community will become more aware of these far-reaching consequences of global warming in the Arctic. That is the least he expects of the United Nations climate conference in Montreal, where representatives of more than 180 countries are talking about measures to combat climate change. Specifically, they are discussing what should be done after 2012, when the Kyoto Protocol expires. Kyoto is the international treaty to reduce emissions of carbon dioxide and other gases causing the global greenhouse effect. Ideally, Canada should have organized the conference in the Arctic, said Stéphane Dion, Canada’s Environment minister and chairman of the summit. But that was not feasible for a gathering of 10,000 participants, the largest ever meeting of all signatories of the Kyoto Protocol. So representatives of the Arctic had to come to the conference instead. A large group of “eyewitnesses to climate change” from all parts of Nunavut, the autonomous territory of the Inuit, has brought perspectives from the front lines of climate change to Montreal – in addition to drum dancers and throat singers. Scientific studies support that view. In northern Canada and Alaska, the average temperature has risen by eight degrees Celcius during the past century, compared to one degree for the entire planet. According to projections, the greenhouse effect will lead to a rise of another four to seven degrees. The area covered by Arctic ice has decreased by almost 30 per cent, measured at its lowest point in September. By about the middle of this century, the Arctic is expected to be free of ice at the end of summer every year. “If your livelihood depends on the ice, that is an incredible change that requires enormous adaptation,” says Robert Corell of the American Metereological Society. His study into the impact of global warming on the Arctic, titled Arctic Climate Impact Assessment (ACIA), took four years to complete and involves some 3,000 scientists who researched various aspects of climate change. For instance, it was found that global warming constitutes a severe danger for polar bears, a powerful symbol of the Arctic. Polar bears hunt for seals, which they catch when they come up through holes in the ice. When the ice melts, bears have fewer opportunities to catch their prey. Less food means a lower body weight and reduced chance of survival. None of this is news to the Inuit. They have reached the same conclusion without scientific studies. Indigenous knowledge has it that Mother Nature has a temperature, and this is a sign that something is wrong. 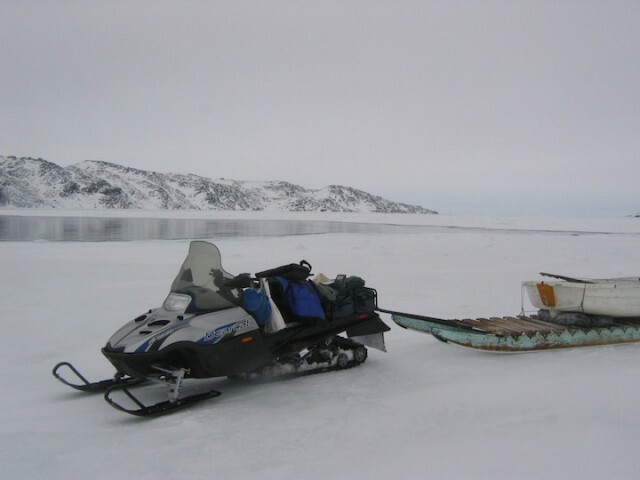 The Inuït people of northern Canada depend on sea ice for transportation to hunting areas.